Rich and creamy Nutella meets up with a soft chocolate chip cookie to bring an explosion of chocolatey goodness in your mouth! 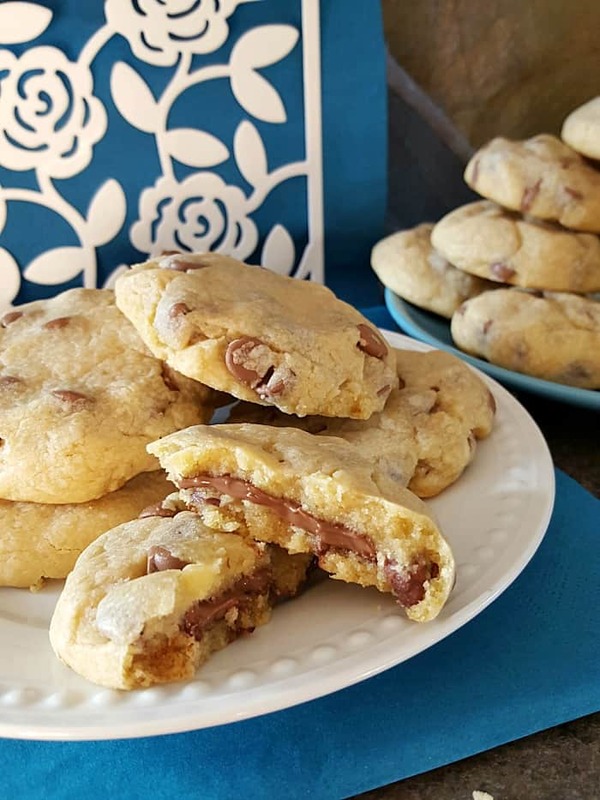 These Nutella stuffed cookies are completely irresistible. With the surprise Nutella filling, you won’t be able to stop at one! This page may contain affiliate links for your shopping convenience. The links help support the blog as we may earn a small commission at no extra cost to you, our readers. 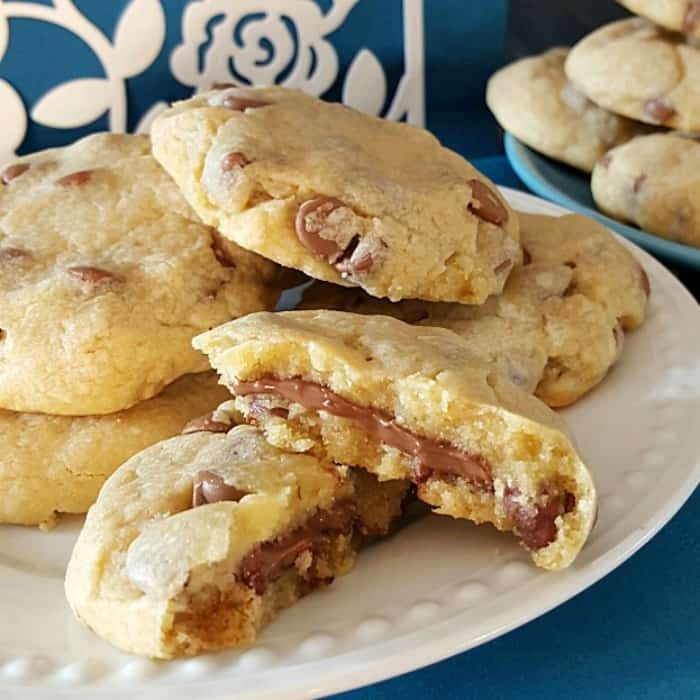 I almost always make a double batch of these Nutella Stuffed Chocolate Chip Cookies and get them in my freezer quickly before they all disappear! I love having baked goods in my freezer ready to pull out when company comes, and as treats for school lunches. This Nutella cookies recipe freeze so nicely, and taste yummy with a slight chill or warmed up. These mouth-watering, irresistible cookies are guaranteed to be a hit with your whole family! In a medium bowl, combine flour and baking soda. In a large bowl, beat butter and both sugars until light and fluffy. Add the eggs and vanilla and beat until well combined. 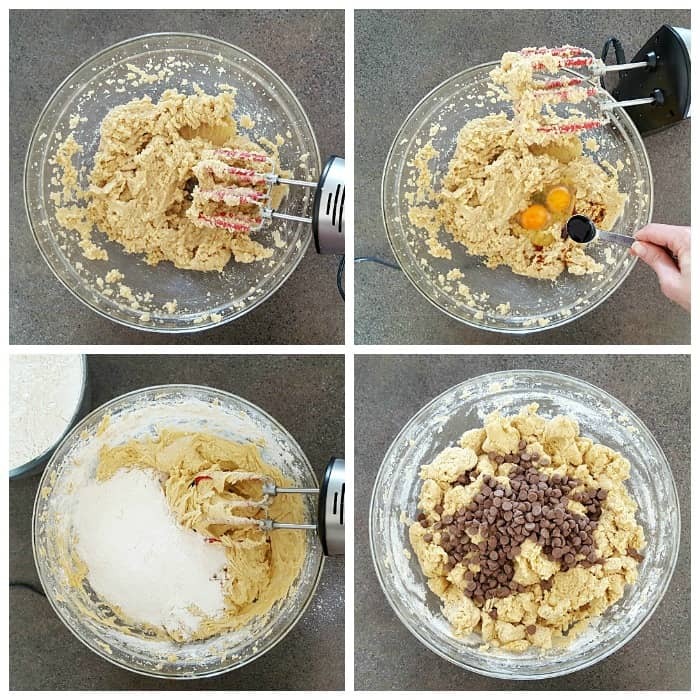 Slowly add the flour mixture and chocolate chips, mixing until incorporated. Scoop a large spoonful of dough, roll into a ball and flatten in the palm of your hand. Drop about 1 Tsp Nutella in the center of the flattened dough. Fold the dough up and pinch together with your fingers to seal the Nutella inside. Bake 12 min or until done. In a medium bowl, combine flour and baking soda. Set aside. In a large bowl, beat butter and both sugars until light and fluffy. Add the eggs and vanilla and beat until well combined. Drop about 1 Tsp Nutella in the center of the flattened dough. 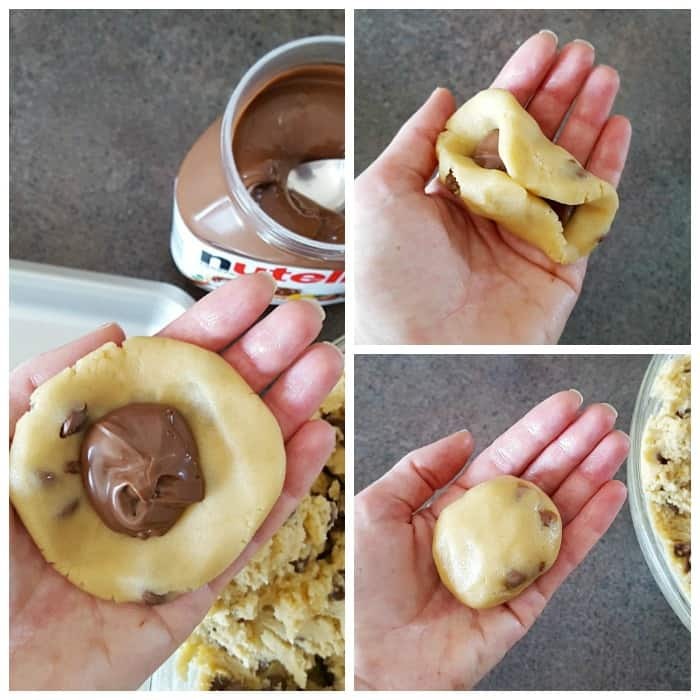 Fold the dough up and pinch together with your fingers to seal the Nutella inside. Check out the Nutella Stuffed Cookie video! This recipe was submitted to Mommy Moment by Heidi. This post contains affiliate links for your shopping convenience. Those Nutella stuff cookies looks so yummy and easy to make! I love Nutella and eat it out of the jar! I’m sure i would eat them all by myself. Ahha, these look so good. Imagine doing half with peanut butter and half with nutella. 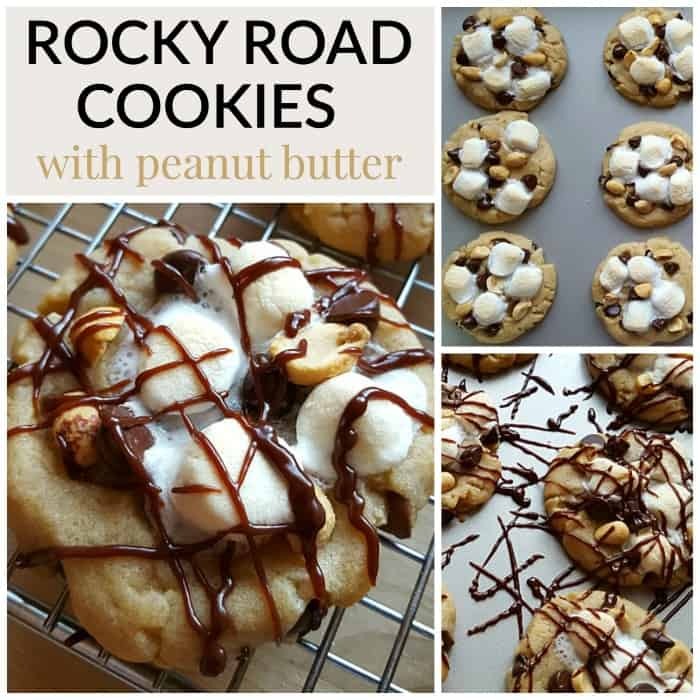 I have a few grandkids that would love these cookies! These cookies look incredibly tasty. Thank you! These cookies look so good that I think I’ve gained 5 pounds just looking at and reading about them. 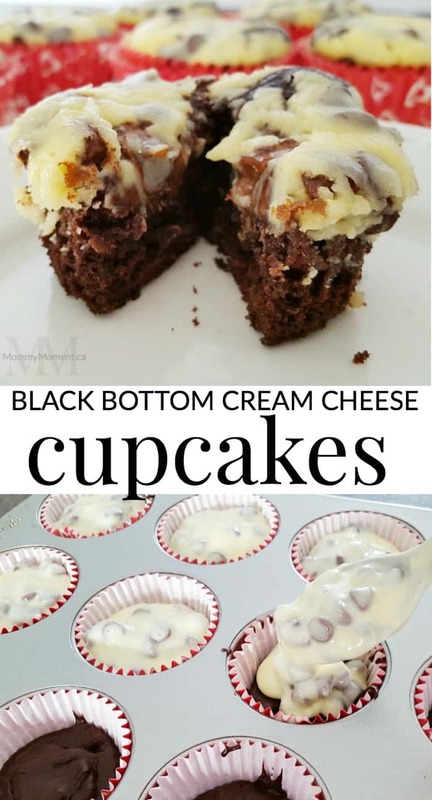 It’s soooo delicious and so easy to make!!! Once the Nutella is added to the dough ball, should I flatten the ball before baking?